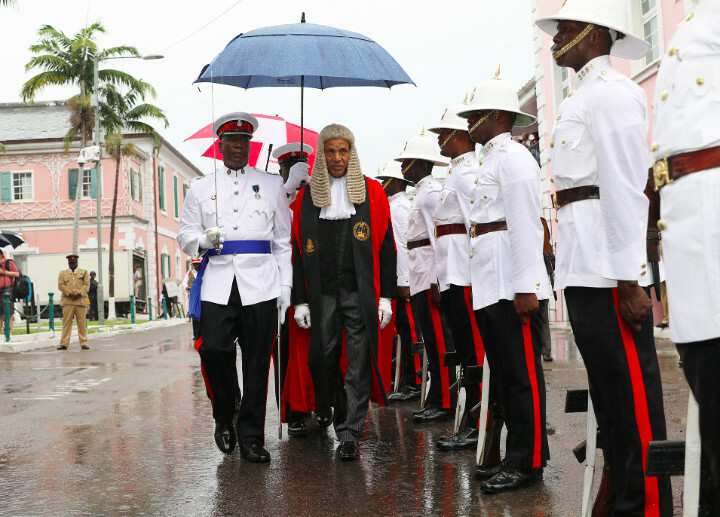 NASSAU, The Bahamas – Despite intermittent rain, Acting Chief Justice Stephen Isaacs officially opened the Legal Year 2018 during a ceremony marked by the traditional, pomp and pageantry at the Supreme Courts, Bank Lane and Parliament Street, Thursday, January 11, 2018. An Integrated Justice System dedicated to tracking criminals, digital audio, bail management and the Advanced Performance Exponents Inc. are among initiatives occurring within the past year which the Acting Chief Justice outlined in his remarks. Moreover, Justice Isaacs addressed “significant” movements within the Supreme Court and judicial education. Chief among the movements is the appointment of Chief Justice Sir Hartman Longley to President of the Court of Appeal in December 2017. Amidst the pageantry and celebrations, the Chief Justice said the judiciary is at the heart of a “vexing” social problem that is plaguing The Bahamas, the rise of violent crime. “It’s genesis is not a single factor, but a combination of factors, which, when taken together, paint a picture of the way that our society has evolved in modern times. “I can only venture to give an incomplete inventory of those factors which begin at birth in the home where guidance begins and where family planning has its greatest impact, in the surrounding communities where young persons are invariably influenced one way or another, in the schools where we try to educate our young people so that they may become productive citizens. In this mix there are positive forces doing whatever possible to create responsible citizens, such as committed parents, youth organizations, the church in its various denominations and the attendant outreach programmes,” he said. Senator the Hon. Carl Bethel, Attorney General and Kahlil Parker, President of the Bahamas Bar Association also delivered remarks. A procession of members of the Legal Profession through Downtown, Bay Street, to the Supreme Court in Bank Lane and Parliament Street preceded the ceremony. The Royal Bahamas Police Force Band led the march.